There are so many great places to eat and comparing a classy Italian place with a classic steak house and family-friendly eatery is always difficult. In the end, I decided to choose the restaurant I visit with my family more than any other place in hte state: Szechuan Tokyo, in West Hartford. 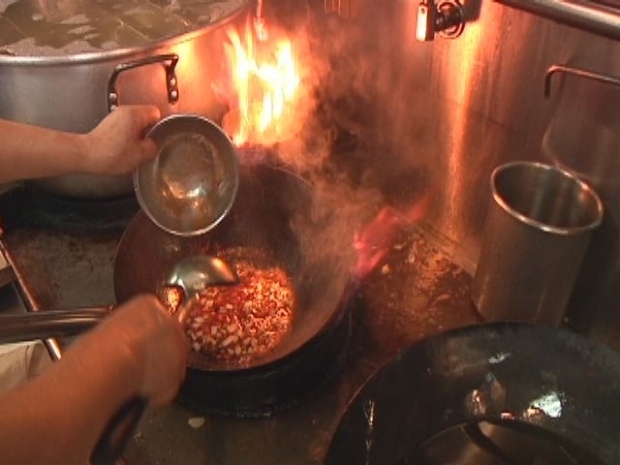 The wok's always hot at the unassuming place on South Main Street. An array of meats and vegetables come together in a fiery dance that's been perfected over centuries. Owners Paul Lewis and his wife, San San, are committed to the rich culinary tradition in China's Sichuan province. "The city of Chengdu to the Chinese is like New Orleans to Americans," said Lewis, who started in the Chinese restaurant business 18 years ago. Brads favorite place to eat. The chef here is called Lao shi, which literally means teacher. He trained in Chengdu and is a master in the flavorful and often spicy Sichuan style. "We call it quon tsai. This is the home food and you'll notice two of these dishes are absent any sort of sauce," Lewis points out. This is not your father's Chinese restaurant, unless dad's from China. Americanized dishes like chow mein, General Tso's chicken and egg foo young are available, but they're not on the menu. The signature dishes include jiao yan xia, salt and pepper shrimp and beef in sizzling chili oil. Both are pretty spicy, but you can always work your way up to the really hot stuff. As part of our "Feasting in Connecticut" series, the members of the morning team we were all asked to do a story on our favorite restaurants. Follow us on Twitter @NBCConnecticut, on and Facebook, and sign up for breaking news SMS alerts on your phone by texting “CTBREAKING” to 622669.